I treated myself to the latest cookbook by Yotam Ottolenghi of the famous London restaurant with the same name. The cookbook is called Plenty More, and I have been literally drooling over it for weeks so I highly recommend it. It is a plant focused cookbook which makes it even more special to me, but the photos are stunning and simply reading the recipes will make you hungry. Many of the flavor combinations in the book are new to me and quite unique. 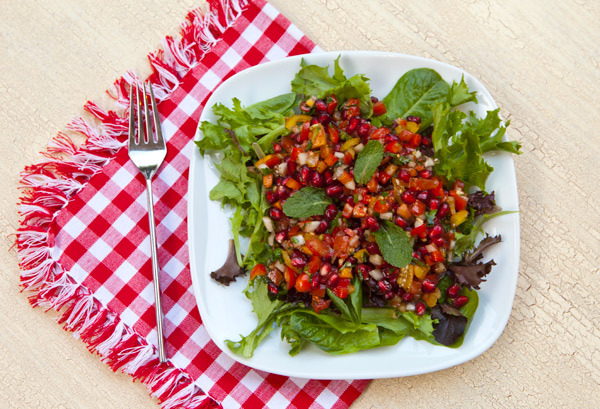 This Tomato and Pomegranate Salad was the first recipe I made from this cookbook, and it was absolutely delicious. Once I tasted the salad however, I realized that I had made something very similar a few times last year that I used as a dip served with whole grain pitta chips. The only difference in my recipe and this one was that my dip was simply dressed with a squeeze of lime and a drizzle of olive oil. 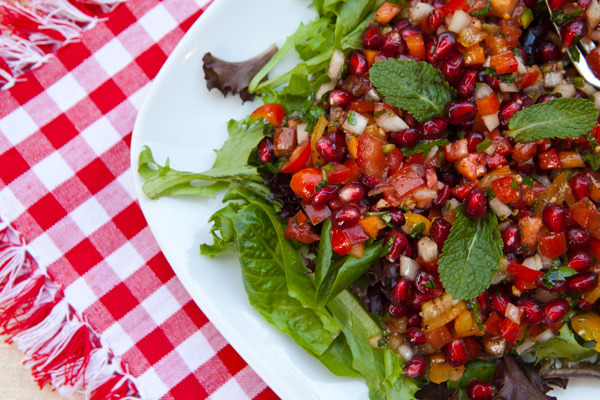 This salad includes a dressing made with pomegranate molasses, vinegar, and olive oil. I also included yellow and orange bell peppers in my version, while the Ottolenghi recipe uses red peppers, and I used just one variety of tomatoes, not four different types. I served this salad on a bed of crisp baby greens, but feel free to use it as a dip as I noted above and serve with whole grain tortilla chips. This salad would also be amazing spooned over grilled salmon or chicken. The key to this salad is to chop all the ingredients very finely so they match in size. Pomegranate molasses can be found in specialty or Middle Eastern grocery stores. It has a thick syrupy consistency and an intriguing tangy flavor. Pomegranate seeds are high in antioxidants, especially C that can help support your immune system, also high in fibre for healthy digestion. Sweet peppers contain vitamin C, thiamine, vitamin B6, beta-carotene and folic acid. 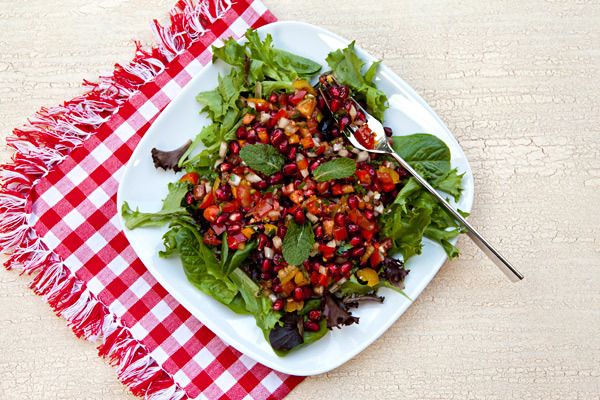 Adapted from Plenty More by Yotam Ottolenghi's Tomato and Pomegrante Salad. In a large bowl, place the tomatoes, peppers, and onions, and gently toss to mix. In a small bowl, whisk together the vinegar, molasses, and olive oil. Season with salt and pepper and then drizzle over the salad. Gently toss together the salad with the dressing and fresh herbs.